Writing a thesis statement is one of the most important parts of composing an essay. It has to be there. It’s the street sign for your essay: it tells the reader where it is going. Without it, the reader might get lost and have no idea where the paper is supposed to take him. The thesis statement also helps you, the writer. It allows you to keep things clear and organized. It helps you to know exactly what your topic is and what you should be writing about. In this article, we’ll look at how to write a thesis statement. We’ll also give you some good tips and examples of how your thesis should look. A thesis statement is a sign post. It tells the reader what the subject of your essay is. The thesis statement = your main point. In other words, the purpose of your paper is clearly identifiable in your thesis statement. In an analytical essay, the writer breaks down a subject into parts and examines each segment, evaluating it for the reader. The essay is an analysis. The thesis statement for such a paper should explain what analysis is being made. For example, if you are writing a paper in which you provide analysis of Germany during the 1920s, you might have a thesis statement that looks like this: Following its surrender in WW1 and the impositions of the Treaty of Versailles, Germany experienced a moral, social and economic decay evidenced in the rise of the cabaret, Dada, hyperinflation and joblessness. In an expository essay, the writer is explaining a subject. The thesis should summarize that explanation so that the reader knows, going into the essay, what the focus is all about. For example, say you are writing an essay explaining Bernini’s David to someone. Your thesis statement might look like this: Bernini’s David embodies the trends of the Baroque: it is dramatic, action-oriented, triangular in composition, and on the offensive. In an argumentative essay, an argument is made and defended. The thesis for such an essay should tell what the argument is and how it will be supported. For example, if you are writing an essay in which you are arguing that the TSA is bad for airports, you might have a thesis statement such as this: While proponents of the TSA view the organization as a last line of defense between air travelers and terrorists, the reality is that the TSA has never actually foiled a single terror attempt but has, on the contrary, devastated the ease and comfort that once went with flying. No matter what type of essay you are writing, the thesis statement should serve as the main point or message of that essay. It should be clear and concise. If you can, try to keep it around 160 characters—similar to that which you might send out in a tweet. Of course, there’s no harm in going over—but if you find your thesis statement going on for 400 or 500 characters (basically four or five lines of text), you should probably think about revising it. Too many words and ideas in a thesis statement will mean that it is more than likely cluttered and ineffective. Keep it as short and as to the point as possible. After all, that is the point of the thesis statement—to get to the point! However, for specific types of essays, the thesis should be comprised of specific elements. For example, if you are writing an argumentative essay, your thesis statement should contain the argument that you are making with some idea of why it is the correct argument to make. If you are writing an explanatory essay, your thesis statement should contain some explanatory summation of what it is you will show. So keep that in mind when composing your essay! Place your thesis at the end of your first paragraph. This is where most people look for your main point: it is a sentence that can sum up what your paper will show in the following pages. It announces the objective of your essay. Don’t make your thesis statement too long. Break it up into two sentences if you have to. But remember—the best thesis statement is one that is short and to the point. Make sure your thesis addresses EXACTLY what you will show in your paper. In other words, it’s no good having a thesis that talks about action heroes if your paper is about why art house cinema. Be specific and on topic. Your thesis should express your position. If you are arguing for or against an issue, your position should be evident in your thesis. Your thesis should be able to answer the question, “So what is your paper about?” in one sentence. You can even write something like “This paper will show…” just to make your thesis more focused. If you don’t want to be so blunt with your statement, simply remove the phrase and—voila!—you have a thesis statement. If you’re having trouble boiling down your essay to one line ahead of time, write your thesis statement last! After you finish your essay, go back and look at it—see what your paper is about, what your main focus is, and then write your thesis and plug it into your intro paragraph. Sometimes this is the easiest way to write a thesis! The formula for writing a thesis statement is as simple as a + b = c, where “a” = your essay’s main point, “b” = how that point is made/shown, and “c” = your thesis. Take your essay, turn it upside down, shake it out, and see what points fall to the table: examine them individually and as a whole. What is the main idea that they are telling you? This will be your main point. Now how are those points coming together? What is supporting them? Evidence, a series of logical deductions, a philosophical principle, an experience? Whatever it is, include that in your thesis statement! If you had to outline your essay, you could see point by point how your essay is constructed. A main idea would be evident. Summarizing this main idea and the approach you take to get there is what would be stated in your thesis. The cause of “x” is found in the combination of “y” and “z”, which occurred as a result of “a, b, and c”. Any variation on the formula above will work—the important thing to notice is that it focuses on causes and effects and looks at both the micro and the macro level. Bring the reader in and out of the micro-level and show the big picture! This is a good way to convince your reader early on that you have command of your subject. Likewise, don’t forget to make mention of the evidence that you will rely upon to make your point. You don’t have to mention every little thing—but you should at least give the reader a hint of how you will make your case. Just remember: don’t let your thesis statement go on for 500 characters! No one wins when that happens. Finally, if you’re still having trouble finding your thesis, try this: start small and get big. Focus on the main point of your essay. What is it? Write that down in a few words. Then focus on how that point is made. Add on this “how” to the few words you just wrote about your main point. There, you’ve just written your thesis statement! Consider what a thesis statement outline would look like. Plug in the parts and see for yourself! Pretend you are writing an essay on global warming. Your thesis might look like this: The problem of global warming is caused by greenhouse gases depleting the ozone, which is evident in numerous studies of the atmosphere over the years. Let’s look at some more examples to get a better idea of what we’re talking about. An analysis of the films by Christopher Nolan reveals a distinct focus on the structure of narrative and how story-telling can be manipulated to produce a climactic event. When analyzed in the light of post-War motives, the Marshall Plan can be seen as a bottomless purse for Cold War spies and agent provocateurs. An evaluation of the epidemiology of the Zika virus shows that the actual source is still a mystery. The evidence shows that a disproportionate amount of viewers are female, which signifies that the so-called universal appeal of the film may not be as accurate as some pundits have suggested. The rules of the game have been changed so much over time that modern baseball does not much resemble the game played in the early 1900s. Becoming a nurse practitioner requires clinical experience, emotional intelligence, and a penchant for evidence-based practice. The novels of Jane Austen can best be understood by viewing them through the lens of the various literary devices popular at the time of their composition. Throughout the 20th and into the 21st centuries, war in the Middle East has been characterized by a push for control of territory, resources, and ideological aims. When Evelyn Waugh stated that satire is dead, he was making a comment on how absurd and desensitized the modern era had become: in effect, what he meant was not that the literary tool of satire was dead but rather that the soul of the modern world no longer cared if it was mocked or not. In the 21st the global economy has consisted of bubbles, central bank interventions, and copious amounts of fiat money being poured into bond markets. There is no way to prove beyond a doubt the veracity of the heliocentric model. Orwell’s Big Brother was not just a warning—it was a reflection of what Orwell himself already saw emerging all around him. The changes of Western society in the last 100 years have more to do with the shift in philosophical and theological orientation than with any other factor. The self-driving automobile is a bad idea because it promotes the takeover of AI as a replacement for human responsibility and attentiveness. Fritz Lang’s Metropolis was a condemnation rather than a celebration of Weimar immorality, as it had come to be expressed in the cabaret nightlife of Berlin. The tower of Babel represented man’s pride, and the effects of that pride are seen in the babbling nonsense of the giants in Dante’s Inferno. The Berlin Wall was not just a divide between the Communists and the Capitalists—it was a divide between the old and the new. The Potato Famine in Ireland was the direct result of British policy. The 1929 stock market crash which led to the Great Depression can be traced back to a flood of easy credit, instigated by the Federal Reserve. The fight between the Federalists and the Anti-Federalists was about whether government would be concentrated in the hands of a few at a centralized level or dispersed locally among the states. The monks of the Middle Ages had a stabilizing and progressive effect on society following the fall of the Roman Empire. The European Union grew out of a post-War need to ensure stability across borders for corporations and countries. The 2008 economic collapse was fueled by speculation on Wall Street and ignited by debtors defaulting on bad loans. The goal of sports should be to teach virtues such as humility and respect to those who play them. The stated aim of the Apollo missions was to put man on the Moon—yet the purpose had more to do with making the U.S. appear better than Soviet Russia than it did with space exploration. Cookies are not good for people. Bad health is something that people should avoid because it is not good for them. Even though there was some inclination of past presidents to tackle legislation regarding women’s rights, this current administration is unlikely to do something about minorities, who are in need of protection because of their own worries about how to play a more equal role in society, which is trying to advance progressive aims by pursuing social justice in colleges across America. The winter of discontent is not just a choice of words by Shakespeare: it also has meaning. The explanation of what caused the Civil War can best be found by looking at the facts. In the war between apes and men, Caesar stands out as a leader. This paper will show that the Planet of the Apes reboot is regressive. There are many good reasons why people should diet and exercise. Nurses must attend nursing school in order to be good at their jobs. Lifelong learning should be promoted because it is good for people. While college education is expensive, the U.S. government should consider making it free. A thesis statement is a way to reduce the main point of your essay down to a single sentence. Sure, you can draft it in two sentences if you want—but the more you can compact it and make it concise, the better it will be. The purpose of the thesis statement is to tell your reader exactly what will transpire in your essay. A common mistake that some people make when trying to write a thesis is to explain too much: their thesis gets away from them as they try to put a macro perspective on the issue they are discussing in the essay. Remember: start small and get big. Focus on what your main point is and then explain how that point is shown in your essay. A good thesis statement will neither be too short nor too long. Try to keep it right at about 160 characters if you can. Think of it as sending out a tweet on Twitter. If you can express a complete thought that makes sense and applies to a specific subject on Twitter, you should be able to compose a thesis statement. It really is no different! You can write your thesis statement first, before beginning your essay. Or you can write it last, after you’ve completed your essay. Either way works fine. Some people like to compose the thesis statement first so they can have in their mind what it is they are trying to do in the paper. Others prefer to construct it last because they feel it is easier to see their main point and how it is supported after they have finished all their writing. The best place to plug in your thesis is in the last line of your introductory paragraph. Spend the first part of the paragraph describing the subject—the background info—or using a hook to lure in the reader. Then give the purpose of your paper: this is your thesis statement. 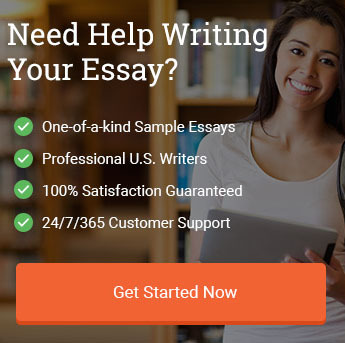 Depending on the type of essay you are writing you should adhere to the basic parameters set forth by the genre’s expectations. If you are drafting an expository essay, be mindful of the fact that your reader would like to know what it is you are going to explain. Tell that in your thesis. If you are penning an analysis, tell your reader what it is you are analyzing and what you have found: this will allow you to start your paper with an effective thesis statement that is to the point and guiding. If you are writing an argumentative essay, let your reader know the subject that is being argued and what your own position is. That way you’ll have a clear thesis statement that not only helps your reader to navigate the rest of your work, but also helps you to stay on track. Remember, your essay should match your thesis—so if the body of your paper does not address the issues identified in your thesis statement, something is off! Be sure the two align. If they don’t, it’s like having a road sign that points in one direction while the road goes off in another: it won’t make any sense and will only lead to frustration and disappointment! 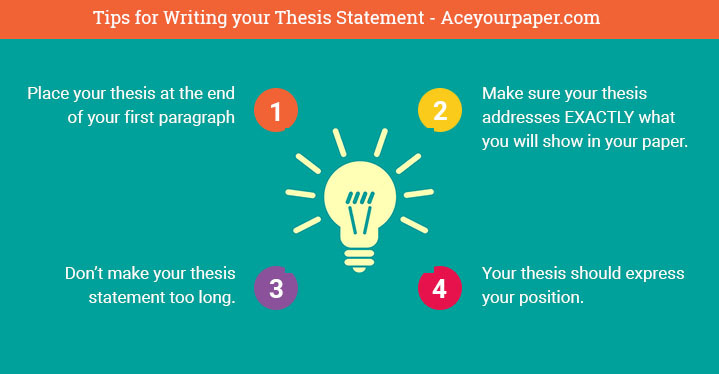 Use these tips and guidelines to craft your own great thesis statement! Good luck and happy writing! "How to Write a Thesis Statement & Examples." Aceyourpaper.com. Student Network Resources Inc, 28 July. 2017. Web. 20 April 2019. Student Network Resources Inc. "How to Write a Thesis Statement & Examples." Aceyourpaper.com. https://www.aceyourpaper.com/essay-writing/thesis-statement/ (accessed April 20, 2019).